Hole In One Insurance Winner, Kevin Birck! Everyone give it up for Kevin Birck of Aurora, Illinois! Birck was fortunate enough to make a hole in one during the Centennial Cup Golf Tournament at Hinsdale Golf Club on July 20, 2012. Birck aced the par 3 6th hole, which measured 162 yards! What’s more? 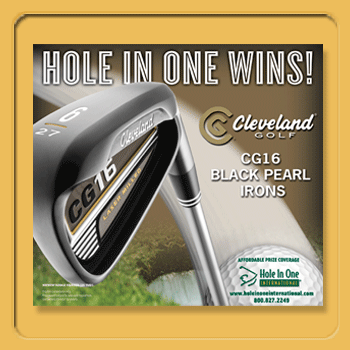 Birck also won a great prize for his ace — a set of Cleveland Irons, compliments of Hole In One International. That’s right: when you purchase hole in one insurance through Hole In One International, we supply complimentary auxiliary prizes on the non-target par 3 holes on the golf course. Want to insure a hole in one at your next golf tournament? It’s a breeze! Either call one of our contest consultants at 800-827-2249 for a free, no-obligation quote… or email us! More of a DIY (Do It Yourself) kind of person? Good news! With Hole In One International’s quoting system, InsureFast, you can obtain a quote on your own, as well as email yourself the necessary paperwork and even pay for it… all online, and within minutes! We make it easy as 1-2-3! P.S. Not familiar with our free tee prize offer? Check it out! Each and every player in your golf outing will receive one free of charge! Hole In One Insurance Winner, Matt Kramarz!2 Hole In One Insurance Winners During Same Tournament! Home » Blog » Hole In One Insurance Winner, Kevin Birck!